Photoshop: Face swapYou get a face, you get a face. Everyone get's a face! Famous for its merits, the face swap is a well common humoristic element, mostly applied to any combination of celebrities, animals or babies. Although, preferable, all of the above. What the most difficult thing about this is, is using different blends. You might have two pictures where people have different skin tones or where the quality is significantly different. That makes this process harder. 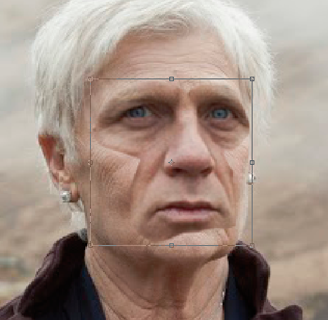 But luckily for us, Photoshop has found a way to make it a bit easier. We’ll see how. Let’s start with an example immediately. This example is easy because I picked one image with two faces. In this case the light, quality and colors of the image will be the same, including the two faces. Let’s take a look at the result. We focused on speed rather than accuracy. But hopefully you’ve noticed something wrong with this picture. Let’s divide our example exercise into different steps and let’s get swapping. We’ll have to mess up some stuff from our image and we’ll end up deleting some pixels. To avoid losing the source file(s), we’ll make copies of our background layer. The moment Photoshop has booted, open the image and make two copies of the background layer (right click on the layer + duplicate layer). We’ll name our layers: original, source M and source B (from bottom to top). You can name a layer by double clicking its current name and retyping a new one. 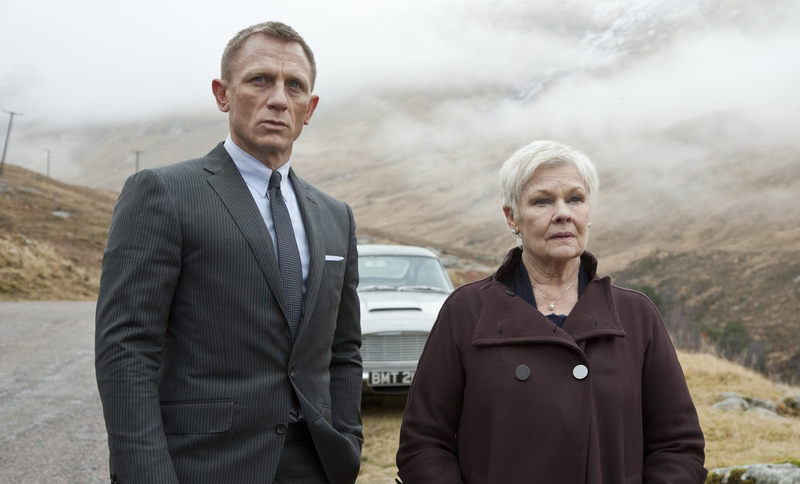 So, what we’ll have to do is copy Bond's face and copy it onto M's face. A selection will have to be made and as a hint, I would advise to include any key features (scars, wrinkles, shadow, make-up, …) when making this selection. I’m using the Polygonal Lasso Tool to do this, but any selection tool will do. When this selection is made, we'll copy and paste it. A new layer pops up and we’ll name it B face. Now let’s move and scale this layer so it overlaps with M’s face. I actually scaled it down a bit as the proportions were a bit off. Focus on eyes and mouth. These should be about the same size and, if possible, on the same location. 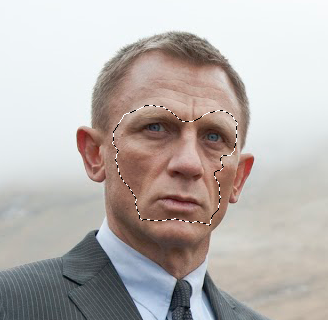 Before we can blend the layers we'll have to make some space for the Bond head on top of M's head. 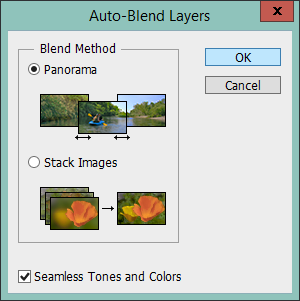 Make a selection of the layer B Face (via SHIFT + clicking the layer icon). 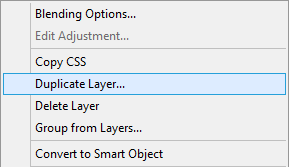 Then, with this selection, go to the layer source B. We'll be deleting M's head out in a second, but first we need to optimize our selection. Blending requires some overlapping parts and now our selection is too wide. So go to Select -> Modify -> Contract and opt to contract by 4 pixels (that did the trick for me). Now press delete or backspace to delete these pixels (just make sure that the layer source B is active). We'll pick Panorama as we want the two layers to combine. Also make sure that the option at the bottom Seamless Tones and Colors is checked on. 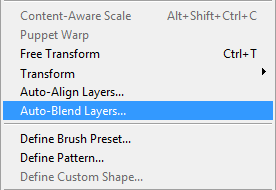 Let's clean that up a bit via a right click on one of the selected layers and picking merge layers from the options. Now select the left side of the image and delete it. You do this pretty fast with the Rectangular Marquee Tool. Now we only have M on this side. And there you have it, both faces swapped. Try it on different pictures if this worked.